Most of the paintings and frescoes in the Vatican are, for obvious reasons, religious in nature. There is one, however, that glorifies a bunch of pagans. 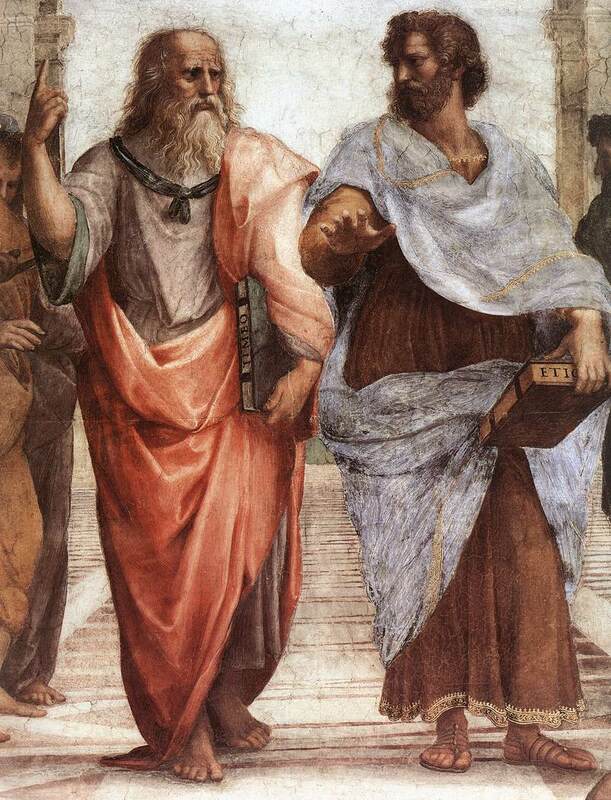 Its name is The School of Athens, and these two jolly men are at the center of it. Plato is pointing skyward because he’s a sort of idealist. His most famous work, The Republic, imagines what the perfect society would look like. He is perhaps best known for a thought experiment called “the allegory of the cave,” in which he describes humans as toiling away in a cave for most of our lives, seeing only shadows of the way things are. Only when humans come up out of the cave can they see the light. The ideal forms are out there, and if we put enough thought into it, we can eventually find them, and make use of them to order our lives and our politics and so on. Aristotle has plenty of things in common with his teacher, but had a rather different approach. He’s gesturing out at the horizon because he first and foremost relies on his observation skills. He assesses the facts around him and, after a while, builds a theory of the way things are. He’s not a big fan of Plato’s thought experiments, which try to figure out the way things should be. This isn’t to say he’s a pessimist; he thinks everything on earth has an end to which it aspires, and by living virtuous lives in accordance with nature, humans can truly flourish. I saw this last night, when I attended a talk at a local university by Robert J. Art, a noted international relations professor who edited the textbook I used back when I was a freshman in college. His talk was an example of political realism par excellence; while people had their quibbles with some things, most everyone I talked to afterwards agreed he had done an eminently reasonable job of detailing the challenges U.S. foreign policy will have to confront in the coming years, and the solutions to some of those issues. He also delighted many in the crowd when he laid a smackdown on the professor who comes to all of these talks and tries to cram everything the speakers say into a rigidly far-left worldview. Still, more than a few people found their inner Plato coming out when they wondered if things were always doomed to be the way Prof. Art described, with an endless posturing and positioning between the world’s great powers, and not much hope for a happier world. He wasn’t necessarily a pessimist about ending conflicts and spreading good governance, but he clearly believed we have to accept the world we live in. Aristotle would be proud. Of course, there are dangers in both approaches. One that Plato anticipates is the problem of re-entry into the cave after a trip out of it. I suspect many readers have been there: you’ve gone out and learned everything there is to know about a subject, become a true believer in some sort of cause, and are then saddened to learn that no one else agrees with you, if they even understand what you’re talking about. Loyalty to ideals can cause serious rifts, as families, friends, and even countries fall out over different ideas over what things look like. There is a certain elitism in the Platonic approach, as people who’ve seen the light are judged to be the only people worthy of properly knowing what’s going on in the world. (Hence the philosopher-kings ruling everything in The Republic.) There’s also the added problem that lots of people who think they’ve left the cave have seen very different things when outside of it, and there’s no good way to know who’s right. An awful lot of wars have been fought between people who think they know how the world ought to be ordered. Aristotle’s approach can also be a bit exclusive. The obvious example that leads lots of modern people to dismiss Aristotle out of hand is his announcement that women, slaves, and “vulgar craftsmen” (people who work with their hands) are unworthy of being citizens. The good news is that the Aristotelian mindset can be rescued pretty easily. Aristotle’s assumptions were based on his observations of those women and slaves and craftsmen, and it’s now obvious that those observations were quite wrong. Aristotle would probably be willing to accept that he hadn’t observed correctly, and lots of people have done their best to re-interpret Aristotle for their times. The modern Aristotelians give some of the most coherent accounts of human nature one can find. Just about every other political philosophy bends over backwards imagining some idealized “state of nature” in which one can supposedly observe humans “as they are.” These can be interesting and sometimes insightful, but they seem to forget that normal human life doesn’t happen in an idealized vacuum. From a strictly practical mental health standpoint, it’s far more pleasant to accept the world one lives in rather than fighting a perpetual revolution. The most well-adjusted people I know all seem to be Aristotelians of one sort or another, even if they don’t know the first thing about the guy. There are still two big dangers, though. One is a retreat to tribal loyalties because they seem most natural, and warfare that comes from lack of understanding of others. (Aristotle had no problem with his pupil, Alexander the Great, going off and slaughtering all the Persians.) The other is complacency, resignation, and even defeatism: the world is the way it is, so why bother doing anything about it? Both of those dangers aren’t true to Aristotle’s philosophy, as he (like Plato) preaches prudent, practical wisdom over such extremes. Still, this can be hard to maintain, and because of that, people occasionally need shocks to remind them that there is a big world outside of the cave. This distinction is only a small part of the thinking of these two men. Alfred North Whitehead once said that “the safest general characterization of the European philosophical tradition is that it consists of a series of footnotes to Plato,” and while we could argue about that, it is true that huge heaps of Western philosophy are somewhere in the shadow of Plato. Aristotle dabbled in practically every field imaginable. Like them or hate them, they had a massive influence on how we understand the world today, and when approached in good faith, they still have plenty to offer.